As I was in need of a new router (I do have a tendency to use tools way after the recommended period, not safe…I know) I went on a quest to find the perfect one. Sure, we all want to have a fleet of such units laying around at our disposal, but this is not realistic budget wise. 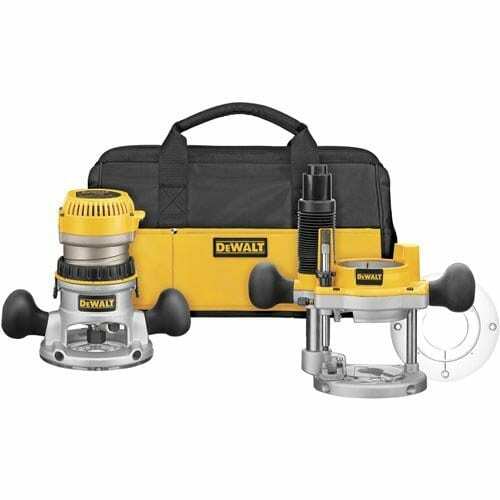 That being said, I tried to find as much information about all sorts of routers, both fixed base and plunge, and became particularly enamored with the DEWALT DW618PKB 2-1/4 HP EVS Fixed Base/Plunge Router Combo Kit with Soft Start. While I realize this might not be the perfect model for everyone, I did my best to make an in-depth review to at least give you an idea about its overall performance. For my needs, I find that the DEWALT DW618PKB 2-1/4 HP EVS Fixed Base/Plunge Router Combo Kit with Soft Start does work beautifully and I particularly like its very effective dust collection system (it catches about 95% of wood dust). As I do most of my work in a fairly small, make-shift shop, this feature does come in handy. I find that the Dewalt DW618PKB router is an ideal choice, both for the professional woodworker as well as the occasional DIY aficionado. All its added features combined with the motor’s power make this unit very easy to use and effective. I believe that newbies will like its more basic features and will be able to effortlessly ease into its more advanced ones. The latter will make the professionals want to add this Dewalt model into their tool repertoire as it is easily installed on a router table. As I’ve previously stated, I too am one of those woodworkers who would just love to have an army of routers at his disposal. However, considering this is almost impossible for most people, it’s best to invest in a model that does almost if not everything you need it to. The more rotations/ minute it allows the better. Also, it’s best to acquire a router that has a fairly soft start. Keep in mind that you will need your unit to be able to handle even larger panel-raisers. Don’t go for a cheaper model that has less power as you will regret it in the end. These should be easy to use. It is best you familiarize yourself with your preferred unit while still in the store. This way you will avoid any disappointment at home. A fairly good balance and some features allowing for a handheld fixed-depth routing. A good level of adjustability for router-table use. You will appreciate this aspect if you mainly work in a very small shop, much like I do. Dust collection attachment, high-quality carrying case, sub base centering cone, guide-bushing adapter/ holder, a few sub bases with different-size openings and an edge guide. Though it’s not necessary to have the all as you can purchase them afterwards, it is best you opt for a model that has most of these accessories. The Dewalt DW618PKB is a fixed-base/ plunge router combo kit with a soft start. Its 12 amp, 2-1/4 HP motor is a fairly powerful one, allowing for a variable speed (electronic) with a full feedback control when under load, reaching anywhere from 8,000 to 24,000 rotations/ minute. Depth adjustments are quite precise thanks to the micro-fine adjustment ring (in 1/64’’ increments). The adjustment is done vertically allowing a constant switch/ cord-set location. One perk that most people will like is the through-the-column dust collection system that permits a collection of about 95% of wood particles. This ensures a great superior part visibility. The steel motor cam lock is also adjustable, tool-free, so anyone could make quick base changes and depth adjustments. Reaching anywhere from 8,000 to 24,000 rotation/ minute (under load), the motor will allow for a smooth routing through the toughest wood varieties. The speed combines with a very soft start will reduce any start-up torque and enhances the overall control of the process. These handles, combined with a low center of gravity, will provide a better balance, control and comfort during the work process. Up to 95% of all dust particles will be effectively collected leading to a cleaner working area and a better functioning unit. An increased superior part visibility is also part of the package. This feature will allow for a precise depth adjustment in 1/64’’ increments, as well as a vertical adjustment for a constant switch/cord-set location. The micro-fine depth adjustment on plunge base is about 5/128’’ per turn. This permits a finer routing process through inlays and veneer. It has both a ¼’’ and a ½’’ collect allowing for both bits. For larger bits, a ½’’ shank is preferred as it does tend to last longer. The die cast aluminum the base and motor protection case are made of will increase the overall durability and will also provide a lighter unit weight for an increased portability. This will increase your overall control over the unit while routing. As opposed to other models on the market that come with a cloth bag, this Dewalt model comes with a hard plastic one for an increased protection. As I was unsure about which router model to buy I had to do a bit of research. Not surprisingly, all units on the markets had hundreds of reviews stating their hits and misses. So…how does the product hold up? While most people gave it four to five stars, there were some who had some issues with the product, well, more with the customer service then the router itself. Let’s start with the good reviews. Most previous buyers well impressed by the high-quality and overall power of the unit, saying it is a pretty great one compared to others in its class. It does handle everything you might put into it, working great with other brand router tables, a nice thing in my book. Some buyers had some issues with getting the motor from one base to another. However, they said it had something to do with the poorly-written instructions and not the DW618PKB itself. The incredibly soft start was also something to be praised as was the no-tool required adjustment. On the downside, some previous buyers had issues with the collet breaking and the brushes burning out. And while I understand this might happen to some products out of a large batch, the bellow average customer service some people described is a no-no for me. Although I do find the DEWALT DW618PKB 2-1/4 HP EVS Fixed Base/Plunge Router Combo Kit with Soft Start a pretty good piece, regardless of some issues a few people described, I do like having options. This router kit from Bosch has a 2-1/4 horsepower and also allows for variable speeds, from 8,000 to 25,000 rotations/ minute. The overall construction is quite sturdy, the unit being made from high-grade aluminum, and has wooden handles for ensuring a soft grip. It comes equipped with a plunge, collet chunks, wrenches, chip shield and some fixed bases. The carrying case provided is also high-quality for an increased level of protection. Another great option comes in the form of this compact unit from Porter-Cable. Its lightweight design allows for an increased portability and comfort. The durable 1.25 HP motor has enough power to meet any expectations, thought applications or not. The adjustment ring enables a good control over bit depth changes to 1/64’’. Also coming with a soft start and full-time electronic feedback that will actually maintain motor speed throughout the cut, this router kit is a good choice for many. This other model from Dewalt is also a good option, albeit only having an 11 amp motor and a 1-3/4 horsepower. That being said, this kit allows for micro-fine depth adjustments, providing a precise adjustments, also in 1/64’’ increments. The steel, tool-free motor cam lock will permit you to make depth adjustments and base changes fairly quickly. The integral, through the column dust collection system collect up to 95% of wood particles and allows for a better superior part visibility, a general rule when it comes to Dewalt models. This Hitachi router kit comes with an 11 amp motor and a 2-1/4 horsepower. The cuts are very precise and easy to control. The high-performance speed control will maintain a constant level of rotations/ minute, even if the workload varies. What I find interesting about this particular unit is the low level of noise it makes, about 79.5 dB, allowing for a quieter work environment. It comes complete with several items – a template guide adapter, 2 collet chucks (1/2’’ and ¼’’), a centering gauge, some wrenches (16 mm, 23 mm, 4 mm Hex Bar), a case, a hex socket and a sub base plate. Overall this model is also a nice choice to consider. All in all, I do find that the DEWALT DW618PKB 2-1/4 HP EVS Fixed Base/Plunge Router Combo Kit with Soft Start work pretty great considering my needs. I do like that the motor is quite powerful, grades above some other units in this class. The variable speeds, 8,000 – 24,000 rotation/ minute under load, are enough for me, though there are some models that can go up to 25,000 rotations/ minute. As for the comments made by some users regarding the collect and brushes not being up to par, I have to say I haven’t had any problems so far and I’ve been using it for 3 months. I think I will just have to wait and see, but I’m hoping nothing bad will happen. Among of the criteria based on which I made the choice was the very effective dust collection system that many people raved about. Though I’m not as enthusiastic as most, I have to say it does work admirably. I am a fan of the very soft start though. All in all, I find the DEWALT DW618PKB 2-1/4 HP EVS Fixed Base/Plunge Router Combo Kit with Soft Start a good purchase and would recommend it to colleagues.